The Alaska Board of Fisheries establishes management plans that govern personal use and subsistence fisheries and their bag limits, their allowable gear, and other regulations. The Alaska Department of Fish and Game manages personal use and subsistence fisheries according to the appropriate management plan. The Alaska Wildlife Troopers enforce personal use and subsistence regulations. Personal use fisheries differ from sport fisheries in both their objective and management. Both fisheries provide Alaskans the opportunity to harvest fish for personal consumption (fish cannot be sold or bartered), but personal use fisheries are managed to maximize harvest potential whereas sport fisheries are managed to provide diversity of opportunity and to maximize economic benefit to Alaska. Also, anyone can participate in Alaska's sport fisheries (provided he or she has a license), but only Alaska residents may participate in personal use fisheries. The Division of Sport Fish generally manages the personal use fisheries. The Division of Commercial Fisheries manages most subsistence fisheries. 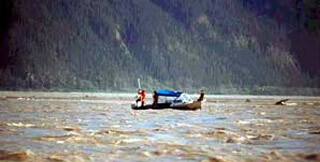 The Upper Copper River Subsistence Fisheries, however, are managed by Sport Fish Division. Management plans are formal, written regulations adopted by the Board of Fisheries (BOF) to conserve salmon stocks and to provide harvest opportunities. The management plans can also allocate fish to various user groups, such as sport, commercial, personal use, and subsistence. The Chitina Subdistrict is now managed under the Copper River Personal Use Dip Net Salmon Fishery Management Plan (5 AAC 77.591). For the Glennallen Subdistrict Subsistence Fishery, Statewide Subsistence Management Codes (5 AAC 77.591). apply unless supersceded by any Copper River specific Subsistence Management Plans. The Glennallen Subdistrict is managed under the Prince William Sound Subsistence Codes (5 AAC 01.647). The plan stipulates management objectives and guidelines, with allocations for each fishery outlined in the Copper River District Management Plan (Sonar Goal) (5 AAC 24.360). The hatchery brood stock and hatchery surplus are adjusted annually based on the anticipated return of wild and hatchery stocks. Prior to 1997, the maximum harvest for the Chitina Subdistrict was 60,000 salmon. From 1997 - 1999, the maximum harvest for the Chitina Subdistrict was 100,000 salmon, given a total return of the in-river goal announced prior to the season, not including any salmon harvested after August 31. In 1998, the BOF passed the proposal that allows permit holders who have filled their original limit to take 10 additional sockeye salmon in weeks when a harvestable surplus of 50,000 salmon or greater will be available in the Chitina Subdistrict. This supplemental harvest is exclusive of the maximum harvest level. In 2000, following the 1999 BOF reclassification of the Chitina Subdistrict as a subsistence fishery, the harvest necessary to meet subsistence needs was determined to be 100,000 - 150,000 salmon. Of this harvest, 85,000 - 130,000 salmon are considered wild salmon, based upon coded-wire tag recoveries from the commercial fishery. In 2003, when the Board of Fisheries reclassified the Chitina Subdistrict as personal use, the 100,00-150,00 salmon goal for the Chitina Subdistrict harvest remained in place. In the Chitina Subdistrict, the weekly fishing periods and limits are established by emergency order and are based on the projected in-river returns. In-river returns are estimated by the sonar unit located at Miles Lake. Based upon previous migration studies, a two-week travel period from the Miles Lake sonar to Wood Canyon is used for management purposes from June through mid-July and a three-week travel period for mid-July until the sonar is removed. The management plan requires that the harvest be distributed throughout the season, based upon the projected sonar counts. The daily allocation of salmon for the Chitina Subdistrict is determined pre-season based upon the projected daily sonar counts. Weekly fishing periods are established from the recent 3-year average catch per hour applied to the weekly harvest allocation. Fishing period adjustments in-season are based upon actual sonar counts, and any salmon above the projected daily salmon escapement are considered surplus. When an escapement of more or less than the in-river goal of salmon actually pass the sonar counter, the Board has mandated that the department decrease or increase the fishing time by the corresponding percentage. Sockeye salmon comprise the majority of the harvest in the Chitina Subdistrict. Since 1990, approximately 95% of the harvest have been sockeye salmon, 4% chinook salmon, and 1% coho salmon. Participation and harvest has generally increased since 1984. Permits and harvest in the Chitina Subdistrict state personal use dip net fishery. Note: Due to poor run strength, king salmon retention was prohibited after mid-late June in the Chitina Subdistrict from 2009-2014. Harvests by the Glennallen Subdistrict subsistence fishery have been estimated since 1965. Sockeye salmon dominate the harvest in the fishery. Chinook salmon comprise the second largest harvest, while a nominal coho harvest also occurs. From 1977 through 1988, harvests in the subsistence fishery averaged 49,777 salmon. The fishery experienced rapid growth from 1980 through 1983, when a peak harvest of about 119,000 salmon were taken. Under the subsistence fishery management plan (and the establishment of the personal use fishery), harvests decreased substantially in 1984 to about 29,000 salmon. Since 1984, subsistence harvests have gradually increased, with the 1,253 permits issued in 2000 and the 88,578 salmon harvested in 2001, the highest since 1983. In 2004, 956 Glennallen Subdistrict permits harvested approximately 55,000 sockeye, 3,300 Chinook, and 600 coho salmon. The percentage of non-Copper River basin participants has increased from less than 20% prior to 1991 to an average of 46% from 1991-2001. The majority of the increase can be attributed to those participants from the Anchorage (26%), Fairbanks (9%), and Mat-Su Borough (11%) communities that entered the fishery following the McDowell decision. Permits and harvest in the Glennallen Subdistrict state subsistence fishery.